Let’s say, just for the sake of argument, that you’re not interested in the Planet Mercenary RPG. How could I possibly tempt you into that Kickstarter? What product could be sufficiently enticing to bring you over to our project page and enter a pledge? 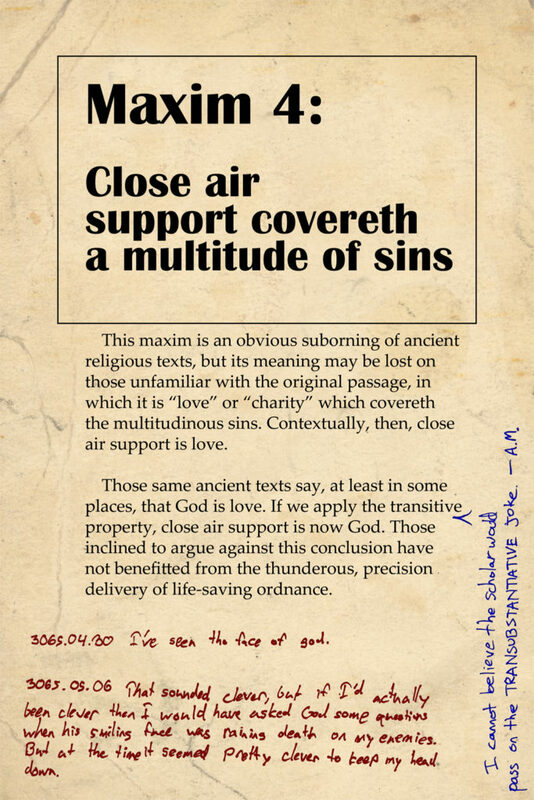 We have a pledge level for the Seventy Maxims book. This isn’t just 70 pages of aphorisms. It’s not something that would fit in the wiki, or on a poster. This is the hardback version of Karl Tagon’s personal copy of the 3001 CE Edition of The Seventy Maxims of Maximally Effective Mercenaries. This is an in-universe artifact. In 2992, in a speech to the CDF Acadamy graduating class, Rear Admiral M. Randall Aarikaida dismissed the book as “an irreverent, irresponsible volume of malevolent canon.” In that same speech, however, he paraphrased maxims 9, 15, 35, and 70 without attribution, unconsciously cementing its importance in the field, and launching countless dissertations which focused on the cultural ubiquity of the very thing he was dismissing. This edition serves as a distillation of that scholarship. The maxims are accompanied by commentary and corollaries, paraphrased, and in many cases translated from the original, unintelligible jargon so that the modern reader might grasp the essential point. By so doing we’ve made this book more accessible, and more affordable because now we don’t need to pay any of those scholars the ridiculous royalties they demand. This page is one of our early proof-of-concept versions, but it shows off the spirit of the thing. Don’t worry: the paper we use will NOT have a printed weathering on it. The weathering in this image is there to evoke the fact that we’ll be using a very toothy, heavy paper with a cream color to it. The boxed text contains the maxims themselves. The text below that is “schlolarly commentary” which, as suggested by the excerpt above the image, is going to be all over the map. The red-pen notes are from Karl Tagon, who acquired this book as an enlistee in 3044. His sergeant at the time told him he should use it as a journal of sorts, and so we’ll get an unordered series of snapshots of his military career. Paging back and forth to put the notes in order will be part of the joy of having this in hard-copy. The blue-pen note above is from Alexia Murtaugh, to whom Karl loaned the book. (Well, “will-have loaned.” That bit of story has yet to appear on line.) While the book is in Murtaugh’s possession it is going to get picked up and scribbled in by a few others, including Sergeant Schlock. We will leave room for you to write in it yourself, of course. Note: PDF and eBook development is a project for another year. The final product wants to be rotated in your hands, dog-eared, thumbed through with multiple fingers holding your places. It is not impossible to translate the experience into a purely electronic format, of course. Just time consuming. For now, we’re offering an in-universe artifact that is meant to be handled, and left out for guests to marvel over.